NEW YORK (BLOOMBERG) - After weeks of relatively calm expectations for a status quo US election result - Democrat in the White House, mostly Republicans in Congress - investors worldwide are boosting hedges against the possibility of a Donald Trump upset on Nov 8. That's in line with - albeit less dramatic than - what analysts have said will happen if the Republican wins or the Democrats sweep, much like the aftermath of Britain's June vote to leave the European Union. JPMorgan Chase & Co raised a third possible surprise outcome in a report on Wednesday (Nov 2) that it said may produce a similar market reaction, the title of which said it all: "I demand a recount." The recent moves reflect worries that investors aren't sure whether to believe reassurances from analysts including Morgan Stanley (Clinton "still favored") and Citigroup (toss-up "overstates" Trump's odds). 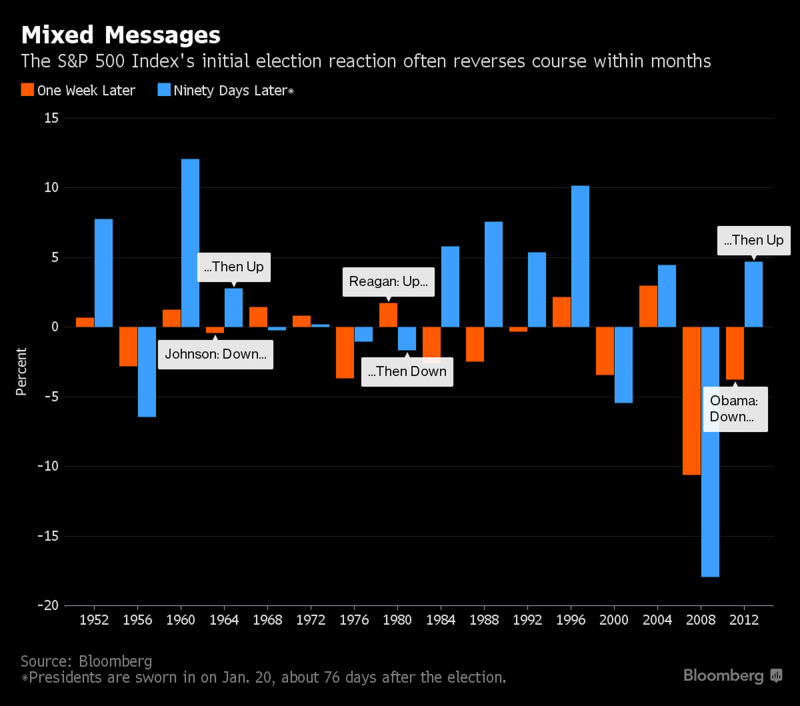 Over the longer term, both candidates want to increase spending and cut taxes which would be bullish for stocks and bearish for fixed income. Clinton Wins: The US dollar would gain versus other developed-market currencies with the Democrat heading toward the White House as traders focus attention on the likelihood that the Federal Reserve will raise rates in December, according to Capital Economics, a London-based research firm. Down the road, Bank of America sees the greenback gaining under Clinton only if the Democrats take Congress. Currencies from emerging markets have mostly priced in a Clinton win, which would be neutral or positive for all countries except Russia, Societe Generale SA said in a report. 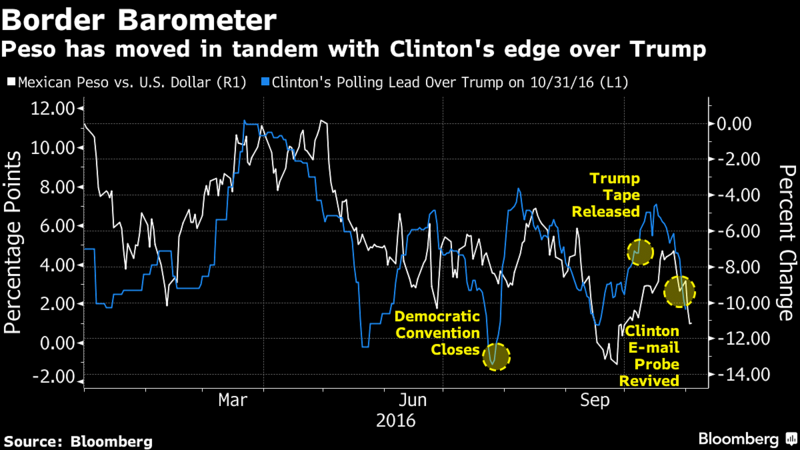 Mexico's peso would benefit from a Clinton win more than any other emerging-market currency, Societe Generale said. It has acted as a barometer of the presidential contest, tending to move in tandem with her chances of defeating a candidate who promised to make the US's southern neighbor pay for a wall between the two countries. Look for China's yuan to "strengthen modestly in response to a Clinton win as currencies sensitive to the outlook for global trade rally in relief," said Sean Callow, senior strategist at Westpac Banking in Sydney. Trump Wins: The foreign-exchange markets this week are suggesting what might happen if the Republican triumphs, with the dollar tumbling against most major currencies and the Mexican peso bucking the trend as one of the worst performers against the greenback. Even after the immediate shock of a Trump win, the US dollar may weaken as developed-market currencies including the yen, euro, pound and franc rally on concern that China would dump US assets and the Fed would delay tightening monetary policy. The greenback could then rally in a three- to nine-month horizon as Republicans usher in tax cuts and other fiscal stimulus to boost economic growth, Bank of America said. The candidate's hostility toward China - including threats of steep tariffs over alleged currency manipulation - likely would drive the offshore yuan down about 3 per cent by year's end, said Ken Cheung, a foreign-exchange strategist at Mizuho Bank in Hong Kong. Longer term, the currency may fall more gradually under Trump as he exerts political pressure on the country's leaders to slow its depreciation, said Xu Gao, an economist at Everbright Securities in Beijing. Risk adversity in the aftermath of a Trump win would also hurt other developing-world currencies on fears that his protectionist stances could hurt emerging economies by reducing imports from them. That "could be negative for high-yielder countries," Credit Agricole said in a report Wednesday. The South Korean won may take a hit, given questions Trump has raised about the need for US troops on the North Korean border. Clinton Wins: It'll be risk-on if the Democrat retains control of the White House, which bodes well for developing markets. Investors may respond by bidding up Chinese defense shares because she comes across as the more hawkish candidate, said Francis Cheung, head of China and Hong Kong strategy at CLSA. Commodity producers in the developing world might rally on expectations that US demand will increase along with infrastructure spending. Trump Wins: "I can't think of any country that would benefit if Trump wins," CMC Markets' Yang said. Evercore's report mentioned one nation that might get a boost, suggesting investors buy Russian equities to hedge against the Clinton-leaning polls being wrong. Citigroup sees the MSCI Emerging Markets Index immediately falling at least 10 percent, with Mexican stocks leading the way down. One possible bright spot for Mexico: Construction companies such as Cemex SAB de CV may be positioned for contracts to build Trump's proposed border wall. In Asia, "China will bear the brunt of risks if Trump wins," said Ken Peng, an investment strategist at Citi Private Bank in Hong Kong, by phone. "He'll probably introduce trade policies targeted against China," weakening its economy. Protectionist US policies also would be "bad for a lot of economies that rely a lot on exports," said Ben Bei, an analyst at CIMB Securities in Hong Kong. Peng said exporters from South Korea and Taiwan are among those with the most to lose. Yang adds Southeast Asia exporters to the list, including companies in Indonesia, Singapore, Thailand, Philippines, Malaysia and Vietnam. To the extent that Trump is less welcoming to workers from abroad, his victory may hurt the Philippines' broader economy, which gets the bulk of its overseas remittances from Filipinos employed in the US, Yang said. "India and Indonesia will be least affected if Trump wins," due to their robust domestic growth, Peng said. Clinton Wins: Her environmental policies, especially her promise to combat climate change, will put pressure on coal and oil. The natural gas market could get a boost from her pledge to wean power plants off coal by using gas as "a bridge" to more reliance on renewables. Trump Wins: Natural gas prices likely would suffer as coal benefits under Trump. He has promised to roll back environmental rules that squeeze coal out of the US power market and promoted "clean coal" during one of the debates. Bloomberg Intelligence in September estimated that a victory by the Republican would shave 11 per cent off natural gas demand in 2030 from last year's levels, boosting coal use. Oil prices could get a lift from the return of a risk premium if Trump continues with the "bellicose language that's been heard on the campaign trail" about Iran and scraps President Barack Obama's nuclear deal with the country, said John Kilduff, a partner at Again Capital, a New York hedge fund focused on energy. Gold, platinum and silver would the "biggest winners" if Trump wins, said Yang, the CMC Markets analyst. Since the day before the FBI's surprise announced that it will examine newly discovered e-mails relevant to its inquiry of Clinton's use of a private Internet server as secretary of state, all precious metals are up, including a 4.8 jump per cent in silver and a 2.2 per cent advance in gold. Copper may also get a bounce, Barclays said, citing moves in the metal's price during the campaign suggesting "a Trump-related premium in infrastructure-related assets given expectations around his fiscal plan." Clinton Wins: "The market has already priced in a Clinton victory," Margaret Yang, a CMC Markets analyst in Singapore, said by phone. "Any upside will be limited if she wins." Barclays Plc said in a report this week that the S&P 500 Index could gain as much as 3 per cent if she wins. The benchmark lost ground on Tuesday for the seventh straight session. Beyond an initial "risk-relief rally on the prospect of policy continuity and predictability," Deutsche Bank AG said that Clinton's plans to limit the capital gains tax break may "have negative/dampening impact on some key risk bellwether assets like equities into the turn of the year." The biggest losers would be finance and drug companies. "A potential Democratic sweep would represent one of the toughest election outcomes for banks," Morgan Stanley Research said in a report, citing the risk of tougher rules and tax changes that might hurt companies like Goldman Sachs and JPMorgan Chase & Co.
Moves against carried-interest rules that benefit asset managers, also targeted by Trump, would hurt firms including Janus Capital Group and Waddell & Reed Financial. Under Clinton, pharmaceutical and biotech stocks "could be hit by renewed pressure to curb price increases on drugs," BlackRock researchers said in a report, noting her complaints about rising costs. Citigroup cut its rating on the European health-care industry to underweight in September, citing US election risks. Drugmakers Novo Nordisk A/S and Roche Holding AG have trailed the broader market this year as Clinton's prospects rose, with the shares gaining only during times when her polling numbers fell. Hospital operators and Medicaid providers such as HCA Holdings and Universal Health Services may benefit from continued Affordable Care Act subsidies, according to analysts from Strategas Research Partners, LPL Financial Holdings and Credit Suisse Group AG. Her plans to reduce dependence on fossil fuels would boost alternative energy producers, with Morgan Stanley touting the prospects of Sunrun and NextEra Energy under Clinton. Trump Wins: "Valuations of US equities are quite high, and a Trump victory will trigger a massive selloff," CMC's Yang said. Many would consider that a classic "black swan event," she added, so the reaction would be "much more severe" than Brexit, which caused the S&P 500 Index to fall 5.3 per cent in two days as benchmarks in Europe and elsewhere lost even more. Investors seeking haven in the yen would be "a negative for Japanese exporters," Yang said. Barclays predicted the S&P 500 would nosedive by between 11 per cent and 13 per cent if Trump wins. The Republican's shifting policy positions make his longer-term impact on particular sectors harder to assess. 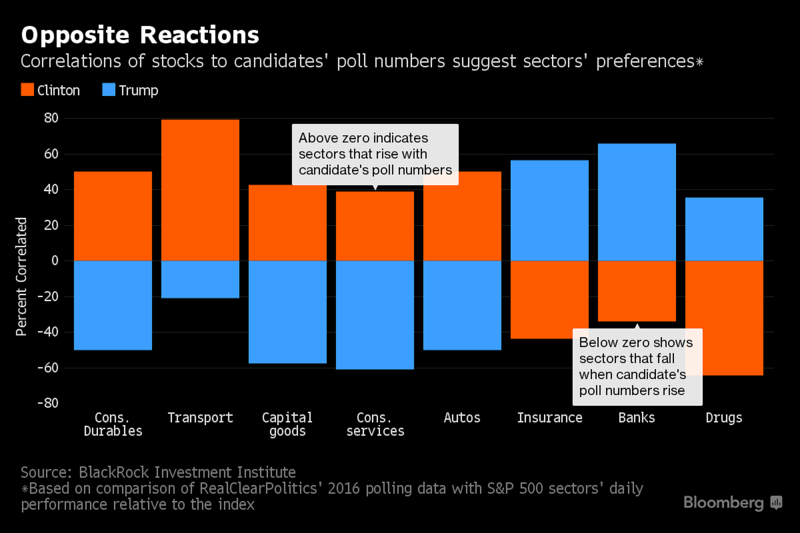 BlackRock's analysis of the correlation between the two candidate's polling numbers and sector stock performance suggest drugmakers, insurers and banks are expected to do better under Trump. Bloomberg News did a similar analysis for individual US stocks. Though finance companies may prefer Trump, BlackRock warned that repealing the post-crisis Dodd-Frank law, derided by the industry's Republican allies, may result in "simpler and blunter but equally onerous rules." Almost all sectors of the health care industry, from device-makers to providers, would benefit under Trump, BlackRock said. Companies that build and maintain civil infrastructure, such as Caterpillar and Ingersoll-Rand, would have bigger opportunities for government work under Trump, given that his plans for such spending are much more ambitious than Clinton's. The same holds true for military contractors, according to a Credit Suisse report. Morgan Stanley sees NRG Energy, which uses coal to produce electricity, benefiting under a Republican White House, due to less regulation and slower growth in the use of renewables. Clinton Wins: A victory by the Democrat would initially drive up yields as investors sell off Treasuries in favor of riskier assets, Bank of America analysts said in a report. Ripple effects would raise borrowing costs for individuals and corporations worldwide because US sovereigns are the global debt benchmark. Yields on 10-year US bonds have risen as much as 36 basis points since Clinton's lead over Trump started widening in late July, and the bank's analysts called the Democratic Party's improving prospects "a major factor" behind that move. They've fallen a bit since the FBI's Oct 28 announcement about the e-mails. Over the longer term, a Clinton victory would do little to yields - as long as Republicans retain control of at least one chamber of Congress - because her fiscal stimulus would be relatively small, especially compared to Trump's plans for bigger tax cuts and more infrastructure spending. A Democratic sweep would likely result in more spending and drive yields higher. Municipal debt could gain under Clinton because any increased taxes she imposes on the wealthy would make tax-free bonds more attractive, BlackRock said. Trump Wins: In the two weeks after Britain gobsmacked pollsters and voted to leave the EU on June 23, the US benchmark 10-year yield fell 39 basis points and didn't return to pre-Brexit levels until September. Something akin to that would happen if Trump defies conventional wisdom, analysts said. Credit Agricole SA predicts a "massive disjoint" that would send 10-year yields down at least 10 basis points if he prevails. After the dust settles, Trump's tax cuts and infrastructure-spending plans may drive yields back up, especially if Republicans hold both the House and Senate. That impact could be exaggerated if the Republican's isolationist foreign policy prompts countries with large Treasury stakes to unload them, Credit Agricole analysts said. Fiscal largess would also benefit inflation-linked bonds, which already are outperforming nominal securities this year. Yields would only remain flat under Trump, according to Bank of America, in the unlikeliest event of all: President Trump finds himself up against Democrats controlling both houses of Congress, because they would resist his massive tax cuts. Trump's support for fossil fuels could spur a rebound for energy industry bonds, especially high-yield ones, after two years of major losses in the commodities slump, Wells Fargo & Co. said in a report. As for munis, "Trump's plan to slash personal tax rates could deal a blow to the asset class," BlackRock's report said.